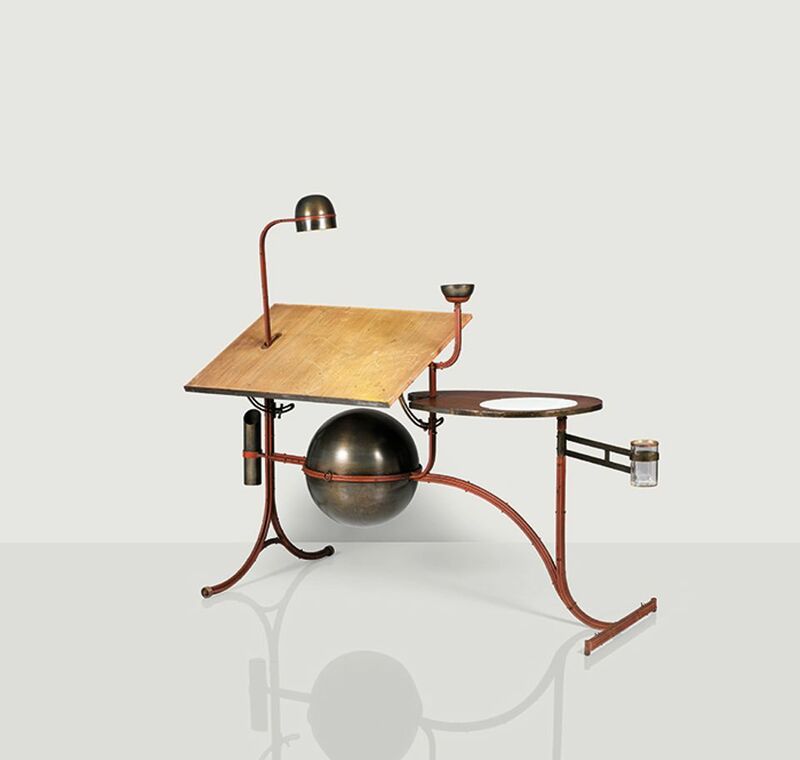 This unique drawing board by the late French sculptor François-Xavier Lalanne was commissioned by fashion designer Karl Lagerfeld, an early supporter of the artist, for his apartment on the Rue de l’Université of Paris. In the mid-1970s, Lagerfeld gave the work to the decorative arts dealer Jacques Grange, who kept it in his apartment in the 6th arrondissement until the 1980s. The piece has a spherical container, a lamp, an adjustable tray and metal and glass containers for brushes and pencils, as well as a leather palette for preparing watercolors and gouaches. “Pieces such as this, commissioned directly by their sponsors, are extremely rare”, says Florent Jeanniard, the auction house’s head of design in Paris. Around the same period this work was devised, Lalanne also designed a bar for Yves Saint Laurent and Pierre Bergé called the YSL bar (1965), which made €2.8m (est €200,000-€300,000) at Christie’s Paris in 2009. Christie’s New York achieved the artist’s overall record in 2011 with a group of ten patinated bronze sheep, designed around 1979, that made around $7.5m (est $600,000-$900,000). This hand-carved maquette of the façade of the famed Alhambra palace of Granada, Spain, shows a triple arch surmounted by four windows, and contains a photograph signed by the Spanish artist Enrique Linares in the background, which shows the view from that vantage point of the hilltop complex. The work also incorporates plaster, carved marble and a wooden frame with inlays. 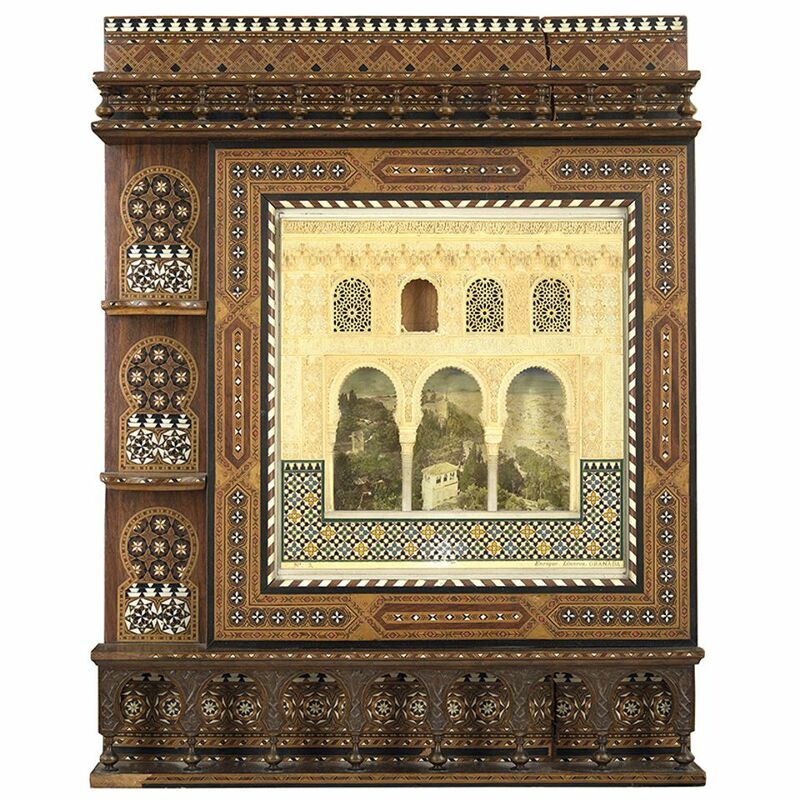 Such mixed-media architectural models of the Alhambra “were made throughout the 19th century and are generally incomparable works of art, executed with astonishing detail”, says Deborah Teboul, the auction house’s director of Asian art. This example has sustained some damage like cracks and fading. Although the Spanish artist’s biography “is difficult—not much is known about him”, adds Teboul, similar examples signed by Linares are included in the collections of the Victoria and Albert Museum of London and the Rijksmuseum of Amsterdam, and have been offered at auction in the $1,500 to $6,000 range. This ceremonial robe, made by a tribe of the Northwest Coast with woven mountain goat wool and cedar bark and backed by either caribou or deer hide, is known as a Chilkat blanket. The piece is similar to a piece one illustrated in a volume of the Memoirs of the American Museum of Natural History, published by the ethnographic photographer George T. Emmons in 1907, which deals with blankets discovered during the Jesup North Pacific Expedition, led by the influential German-American anthropologist Franz Boas between 1897 and 1902. Emmons writes that such pieces were unisex and tell mythical stories .He deciphered the patterns of this blanket as “a bear underwater, [with inverted faces under each jaw [and] adjoining wing design; [...] the lateral fields [show] the raven sitting [with its] beak turned outward [...]”. 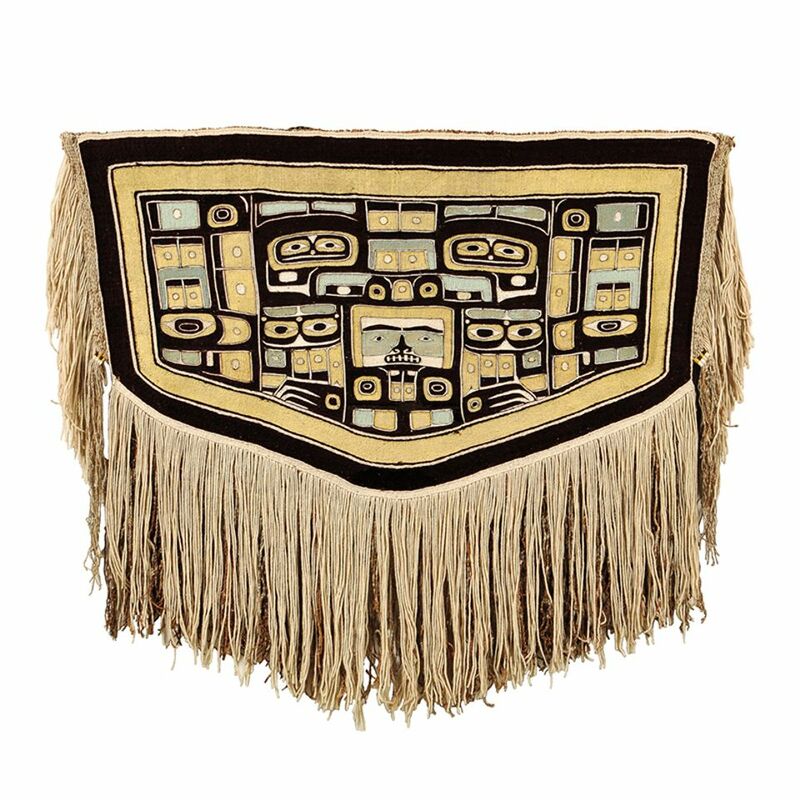 Similar Chilkat blankets are included in major collections like the Metropolitan Museum of Art and have fetched up to $42,000 at auction.